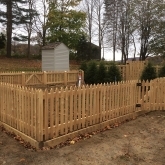 When you hire Roots Landscaping you receive the services of a team of professionals who have already completed dozens of fencing projects in the Trumbull CT area. We take great pride in our fencing work and our 17 year legacy of excellence. No matter whether your job is large or small you can rest assured that Roots Landscaping is the best fence contractor for the job. 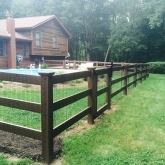 Roots Landscaping is the fence company that you and your family deserve. There are many different varieties of fences available for you to choose from for your Trumbull home and many reasons you might want one. Perhaps you are concerned for your pets, wish to protect your property, or simply want some privacy. No matter what your reason, we will provide you with the highest quality of care and work closely with you to make your wish come true. Our expert enclosure associates provide excellent, quality fencing for most needs. You can visit the Roots Landscaping Fencing for more details. Installing a fence is often unexpectedly difficult. Unexpected terrain issues and other complications can wreak havoc with even the best laid plans. 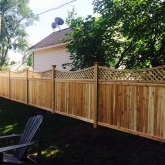 Consequently it is often better to get an experienced and professional fence company to do it for you. Roots Landscaping is just such a fence company and with our help your fence will be installed quickly and safely. We’ll start by investigating the terrain surrounding your Trumbull home in order to anticipate any issues that could occur. Afterwards we’ll get straight to installing your fence and you can bet that it’ll be installed in no time. A very common cause of fence collapse is wood rot. This is when fungi get into the wood and begin to eat away at it. This leads to decomposition and eventually starts to cause collapses. Luckily Roots Landscaping is a fence contractor with a lot of experience in this area and we are prepared for the job. In order to solve your problem we treat your wood with a special chemical agent to eliminate the mold and patch it. We can even repaint it afterwards or stain it. 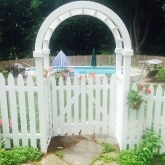 Either way your fence in Trumbull will look as good as new. Another major issue that can occur is the deterioration or collapse of fence poles.These poles are often crucial to the structural stability of the entire fence and their collapse can cause large sections of fence to fall. We at Roots Landscaping can help prevent this by replacing poles that may be close to collapsing and inspecting the terrain to remove any issues that may be hastening this decline or preventing the fence pole from operating correctly. Many fences also come to have issues with holes or cracks. If your fence has holes or cracks we can repair and fill them for you. 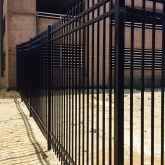 The exact procedure differs based on the type of fence (for example whether it’s wood, vinyl, or aluminum) but we are fully equipped to handle any fence type. Your Trumbull fence may also suffer from missing boards.This can be a serious issue as missing boards can cause fence collapses and fixing a collapsed fence is more expensive. Roots Landscaping is fully equipped to repair or replace these missing boards. 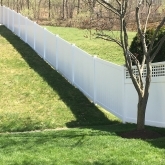 The repair process will differ based on the height and length of your Trumbull fence but we can tell you how we can repair it while also providing a cost estimate. 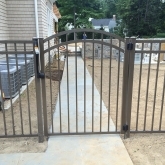 Roots Landscaping provides superior fence installation, expert masonry, structural repairs and supplementary landscaping services and is the top fence contractor for Trumbull CT. 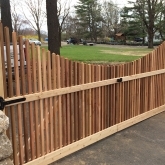 If you are interested in our expert fence installation or repair services please give us a call at 203-304-7326. Even if you are not certain what services you need yet our professional team will investigate and help you decide.